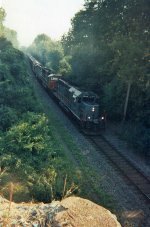 Description: CN 5696 trails as the second locomotive on CSX Q621. Description: The southbound passes the Wausau Daily Herald building. Description: CN 5696 leads NS 184 east towards Oak Harbor. Description: Shot on the other side of CP's Belleville Sub, as CP 122 (expressway) goes by in front with CN 5696 going by on CN's Kingston Sub. The VIA station in Cobourg is fantastic in that on one side you have CN, and the other their is CP. Description: Shot through the CP crossing as an expressway passes by.